[This review was originally written by J. Monkman for indiegames.com, and has been reposted here with the editors permission]. Locomalito and Gryzor87 are on fire right now. It seems like only yesterday that Gaurodan came swooping down onto PC and Ouya screens and now they've released a four-player follow-up-of-sorts to They Came From Verminest. Inspired by the likes of Wizard of Wor and Battle City, Verminian Trap has the player (and up to three friends) stranded in an alien bug nest with zero chance of escape - the only option open to you is to take out as many of the little critters as you can before you ultimately end up as their lunch. 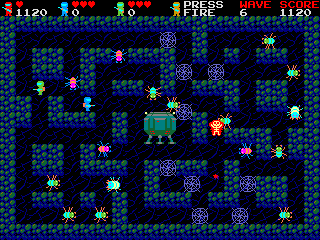 Originally intended as an exclusive game given to people who have made donations via Locomalito's site (and based on a prototype he developed in a single afternoon for RetroMadrid), as a single player game Verminian Trap is an admittedly slight experience. 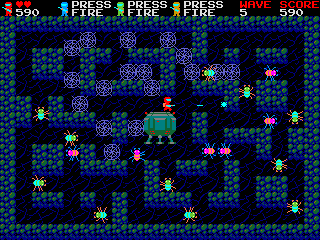 There's still a fair bit of old-school fun to be had with your lone soldier wandering around the maze taking on endless waves of bugs - but add some beers and some friends and it's a real blast. 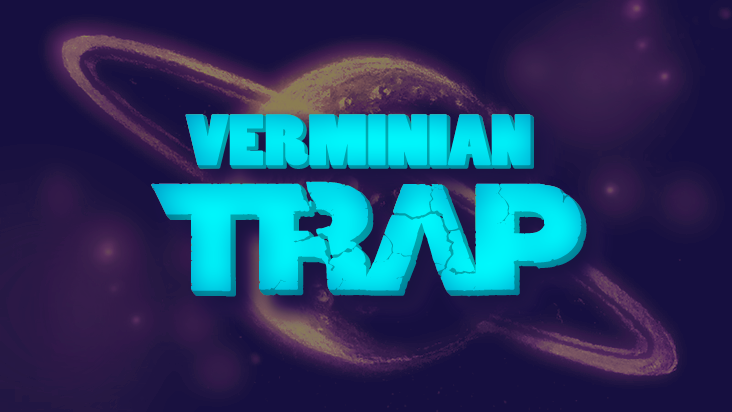 Verminian Trap was actually designed to be played co-operatively for a high score, but often the game evolves into an unofficial death-match after a few accidental friendly fire incidents. Although you cannot actually kill the other players outright, your shots will stun and freeze your 'opponents' for a second, leaving them as easy prey for the marauding insects and dropping power-ups that they've collected when they die. Understandably, even the most earnest of high score attempts can easily become a player-vs-player bloodbath - the super cute animation when you stun a fellow spaceman is just too endearing. In addition to a PC, Linux and Mac download, Verminian Trap has joined Locomalito's Gaurodan and Endless Forms Most Beautiful on the Ouya console's Discover store. All versions are completely free. Download the PC/Linux/Mac version here (from the developers website). Download the Ouya version here (from Total Ouya). Just downloaded this on Ouya. Fun game with a great Wizard of Wor retro feel.